Pictured below are different SYHA travel jerseys. Please contact us if you have a jersey you would like to see pictured on this page!!! All jerseys will be returned ASAP!!! numbers, names and manufacturer tags. Front tie-down. Collar tag. Manufactured by Titan. Size XL. 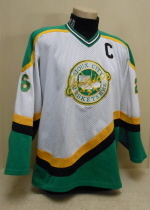 This on was worn one season by forward Nick Batcheller. Screened crest. 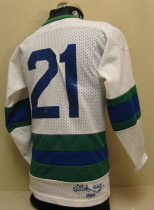 Heat applied, two-colored numbers on back and on sleeves. Manufacturer tagging in collar, on front and on back. Made by Reebok. Game Socks. 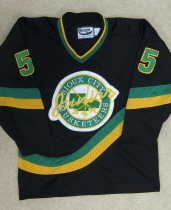 This style black jersey/socks were worn for two seasons with the B team wearing the black version and the A team wearing the white version. 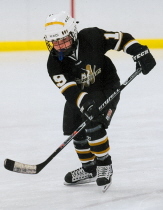 Worn for Sammy's first Bantam season 2010-11. 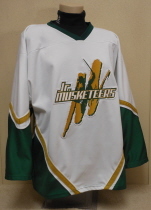 This would be the final season for this style jersey and Jr. Musketeer logo. Embroidered Metros logo. Single color sewn-on numbers on back and single color attached name plate. Manufacturer tag in collar and on hem. Green game socks. Size Small. Made by OT Sports. numbers. Made by Aarons sportswear. between periods at the Musketeers game, both at the TEC. Three color old style logo. Two color sewn-on numbers. 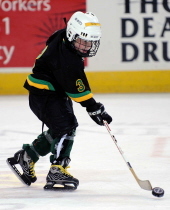 Worn two seasons starting in 2003 by Benny Holzrichter while playing for the PeeWee A team. 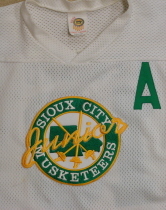 Sewn-on embroidered Jr. Musketeers crest . crest . Two color tackle-twill numbers. Single color attached nameplate. 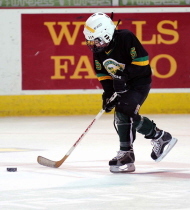 Captain "C" added for 04-05 season. Game Socks. Mesh Material. Made by Aaron Sportswear with tag on right back hem. 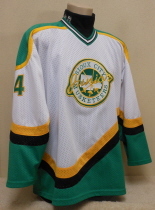 Size S.
Worn two seasons starting in 2002 by Colt Ludwig while playing for the Bantam A team. Sewn-on embroidered Jr. Musketeers crest . Two color tackle-twill numbers. Single color attached nameplate. Mesh Material. Manufacturer and size tagging in collar. Made by Aaron Sportswear. Made by Aaron Sportswear. Size M.
Worn two seasons starting in 1998 by Ricky Charteir while playing for the Bantam A team. Manufacturer tagging in collar and on hem. (Hem tag is heavy "relief" stitching ) Made by Aaron Sportswear. Size L.
First (??) season the "Wave" design for SYHA teams. Attached embroidered logo. 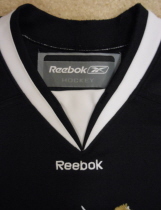 Sewn-on black Alternate captain "A". Two color tackle twill numbers on sleeves and back. Removed nameplate. Fine mesh jersey made by Aaron Sports. Size M.
First (??) season the "Wave" design for SYHA teams. Attached embroidered logo. Two color tackle twill numbers on sleeves and back. Fine mesh jersey made by Aaron Sports. 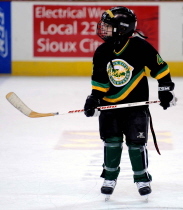 Eddie Navarette Travel PeeWee/Bantams ????? Worn by Eddie Navarette. 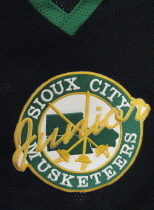 Attached Jr. Musketeers crest. Mesh material. Manufacturer tagging in collar and on hem. Tackle-Twill name plate on back removed. Game socks. Made by Cooper. 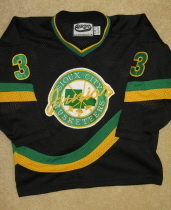 Worn during the 94-95 Peewee season by Brant Mozak. Sewn-on embroidered Jr. Musketeers crest. Heat applied single color name (no plate) and shoulder numbers. Two color heat applied numbers on back. Collar tagging. 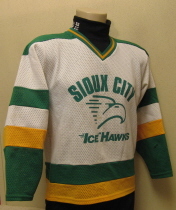 Worn during the 94-95 Peewee season by Brian Swanson. Sewn-on embroidered Jr. Musketeers crest. 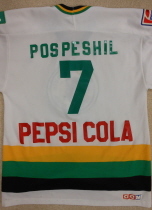 Worn during the 94-95 Peewee season by Robbie Lessard. Sewn-on embroidered Jr. Musketeers crest. Sewn-on Alternate Captain A. 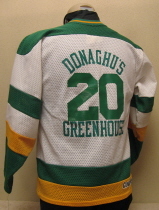 Worn during the 1991-92 Bantam A season by Chris Headquist. Screened on logo. Fine mesh material. Heat applied numbers. Worm by Trent Mozak. 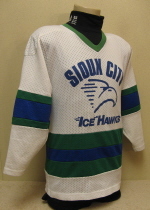 Ice Hawks were the PeeWee A Travel team. Light mesh jersey. Screened crest. Heat applied numbers. Stick Shack logo on hem. Made by Opti Sportswear. Size BXL. Worm by goaltender Chad Stewart. 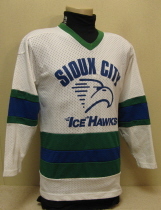 Ice Hawks were the PeeWee A Travel team. Light mesh jersey. Screened logo. Heat applied numbers. Stick Shack logo on hem. Made by Opti Sportswear. Size BXL. 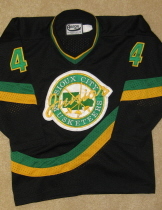 Worm by Nick Lowe during the 1989-90 season. 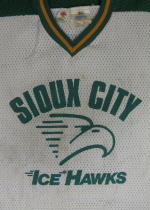 Ice Hawks were the PeeWee A Travel team. Light mesh jersey. Tournament and advanced to the Central District Tier II tournament in St. Louis. The local Pepsi bottler sponsored the trip. on jersey. Screened numbers. Manufacturer tag in collar and on hem. Made by CCM. 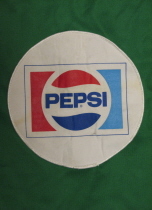 This green jersey with the Pepsi logo on it was used in the latter part of the 86-87 PeeWee A travel season. Worn by Cody Delperdang. green ones were ordered, logoed and numbered at the last minute. 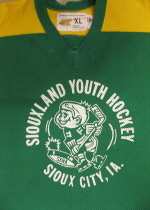 PeeWee A Travel jersey worn during the mid 80's. 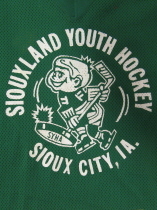 Screened Lil' Joe SYHA logo and Sioux City, Iowa on back. heat applied numbers. Norway.They would play five games in different locations in Norway against local all-star teams over a period of ten days.